Rain, rain and more rain can this Summer get any worse? Over our road one wet day there were forty plus House Martins desperately trying to catch any airborne insects. At the Golf club the Swallows have abandoned any thoughts of second broods and most have already gone South. On the only dry morning of the week I saw two Red Admiral butterflies at Dovestones reservoir – the first I have seen this Summer. On the Golf Course Siskins are still feeding in good numbers and at least four Bullfinches were also present. 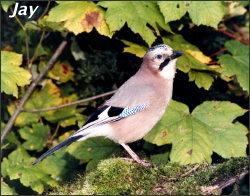 Jays are now becoming more noticeable and with a good acorn crop beginning to mature they may stay with us all Winter. There are still three coming into our garden.